More than 100 people have inquired about the post left by a woman who quit her job by uploading a video of herself dancing to the Kanye West song "Gone", her ex-employer says. The Taiwanese animation firm Marina Shifrin worked at made a video riposte after her YouTube clip went viral. 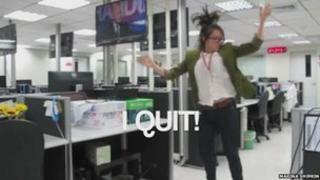 In their version company employees dance to the same track wishing her luck and advertising her vacancy. Ms Shifrin has been offered a job by Queen Latifah on her US chat show. While appearing as a guest on the Queen Latifah Show she was asked if she might be interested in a role as a digital content producer. Ms Shifrin - who is now back in the US - thought it was a joke until Queen Latifah said: "I'm a boss and bosses can hire". The celebrity tweeted later: "This girl was so creative! I had to offer this internet sensation a job." Ms Shifrin worked as a comedy writer at Taiwan's Next Media Animation - a company that produces comical cartoons tied to news events. The subtitles to her resignation video said: "For two years I've sacrificed my relationships, time and energy for this job, and my boss only cares about quantity and how many views each video gets, so I figured I'd make one video of my own to focus on the content instead of worrying about the views. "Oh and to let my boss know... I quit." The video has received more than 12.5m hits on Youtube so far. But in a move that some will regard as a canny public relations step, the company also uploaded a video in which her former colleagues dance to the same song. Her colleagues' spoof presented their office as a fun place to work complete with a swimming pool. "We run a creative shop, not a sweatshop. We are not really upset as we know Marina and she is a good egg. This was seen by her as a funny way to leave. She was right, it is awesome," Mark Simon, spokesman for Hong Kong-based parent company Next Media told the BBC. Many Taiwanese viewers also supported her move on social media, with some saying they admired her for having the gumption to do what many Taiwanese workers would never dare to do. "Really brave and humorous too!" one user posted. Next Media Animation said that they had more than 600 employees who - like Shifrin - worked an average of eight hours a day and that despite some "creative differences" there were no hard feelings. Ms Shifrin could not immediately be reached for comment. But one indication of her thoughts on what had transpired since her video was posted came in a message she wrote on Twitter: "Is this real life?"